the ipoh taugeh is even shorter. :) the shorter it is, the better! I’ve never seen short Ipoh taugeh. Ipoh taugeh always has a fat, long and juicy sprout, at least from the ones I’ve seen. Yeah it does eh bro? Eh? You mean the reptile and not the shoe brand right? We have long aloes like that here too… Those short bean sprouts look like white tadpoles. 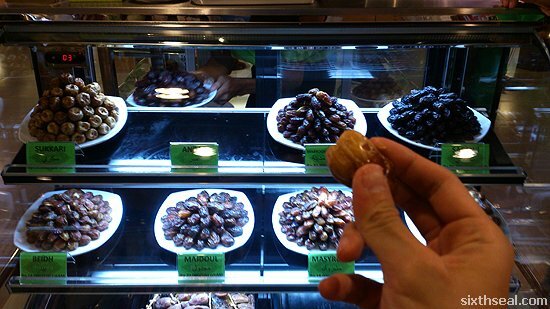 The huge aloe, the sprout less bean sprouts and the Sukkari dates. Hey Huai Bin, I think the Indonesian aloe vera is long partly because of their soil. Now that I’m looking at it, it sure looks a little like the miniature crocodile toy. Their radish surely looks about the same as ours. Interesting! It’s the soil that makes it grow to such monstrous proportions eh? Hmm…good question about the aborted sprouting process. Maybe they just harvested it as soon as it shows signs of sprouting? 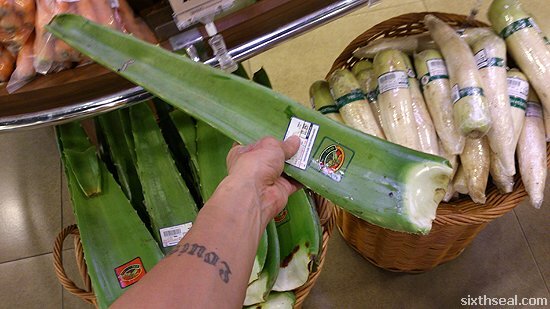 I remember seeing those long aloe veras in Malaysia before but them stunted bean sprouts is something new. Heh! Yeah both extremes of the size spectrum. sounds uh… healthy, if somewhat unusual, the sprouted beans i mean (won’t even call them bean sprouts). i wonder how best to cook those! 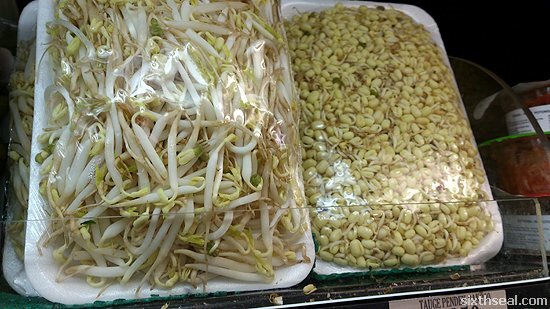 Yeah, I wonder what recipe calls for beans sprouts like these. I bet it’ll taste a bit different since it doesn’t have the sprouting bit, just the bean an a wee bit of sprout. never seen those short sprouts too. did they trim off the tail?